Forex Trading: Big figures (ending 00) often represent critical levels in the forex markets. Many market participants place their stop orders at big figures which can create market volatility to be exploited by short term traders. Round numbers act as psychological support and resistance in many financial markets, and particularly so in forex. Prices are often drawn towards big figures with the big figure frequently tested a number of times before finally breaking through. 1. We ride price action up / down to the big figure, taking profits at the round number. 2. We fade the big figures subject to our counter trend trade filter rules (detailed below). 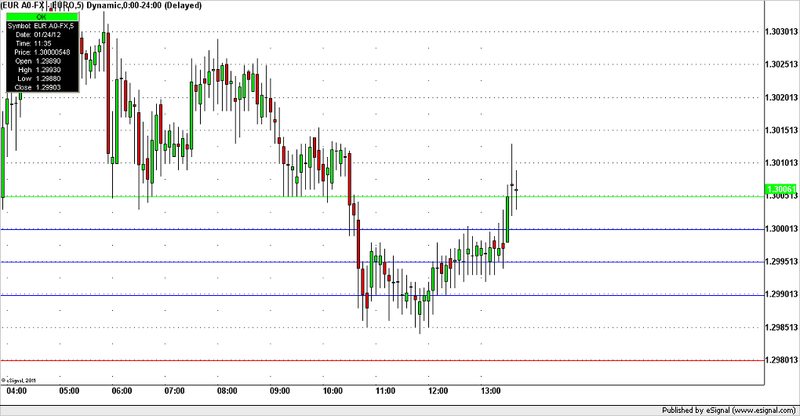 Take a look at the Euro currency setup on the chart below made during the early morning Asia session (01/24/12). Euro currency finally broke through the psychological 1.3000 level to the upside Monday morning US session (01/23/12), later pulling back to retest 1.3000 BIG figure. 3. Buy unit 3 at 1.2990, Stop Loss at 1.2980, Profit Target 1.3005. These levels are shown on the chart below: blue line is our entry, red line is our stop loss, green line is our profit target. The above 3 conditions typically precede breakout moves and we do not wish to be caught out on the wrong side of a breakout: we instead trade volatility breakout strategies on these days.